Previously when mentioned web , people understand that they are static content through a content development time was able to be customized and become "dynamic" and more interactive. Today the web has made great changes, people mention the social network interaction between people, or the "Web Application" in service jobs that would normally use independent software . - Can run without internet and make updates to the server when a connection back. And in Vietnam is about to appear editing software's online lectures ftp-visky-bachkim editing software or online quiz bitjsc, editing software's online timetable of bit tech. There are many technology what is used to create RIA applications , but the market share is critical for the Adobe Flash-Flex, Ajax-DHTML, and recently is Sliverlight of M$. The technology platform is powerful enough to create RIA applications large companies but also did not care for Vietnam. This is understandable because Vietnam mainly outsourced, now appears many companies do web 2.0 and social networking applications, but they have not seen much RIA. 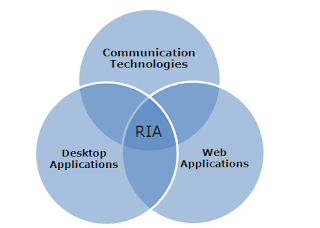 Technology is mainly Flash and DHTML, some companies qualified technicians to build RIA applications is not much, I know there are a few companies that are hired outsource RIA applications with DHTML Home mainly webOS (web-based operating system). Bachkim is essentially a chemical product online violet (also made of flash is primarily). BIT Inc. is mainly used Flex-Flash and a little DHTML. RIA market, including the production and outsource currently mainly are in India's companies , if Vietnam want to join, the first must to change the way of thinking of managers,and then technical staff.